Bring 4 quarts of water to a boil in a large pot with a 1/2 tsp salt. Once the water is boiling, stir in wheat berries and partially cover. Cook for one hour, stirring often, until wheat berries are tender but chewy. Meanwhile, prepare the dressing by simmering orange juice in a small sauce pan until reduced to 1/3 cup, about 15 minutes. Pour reduced orange juice into a small boil and cool in the refrigerator for 10 minutes. After cooling, whisk in the remainder of the ingredients and set aside. To assemble the salad, toss the chickpeas, red peppers, feta, green onions and wheat berries in a medium bowl with half of the dressing. Salt and pepper to taste. 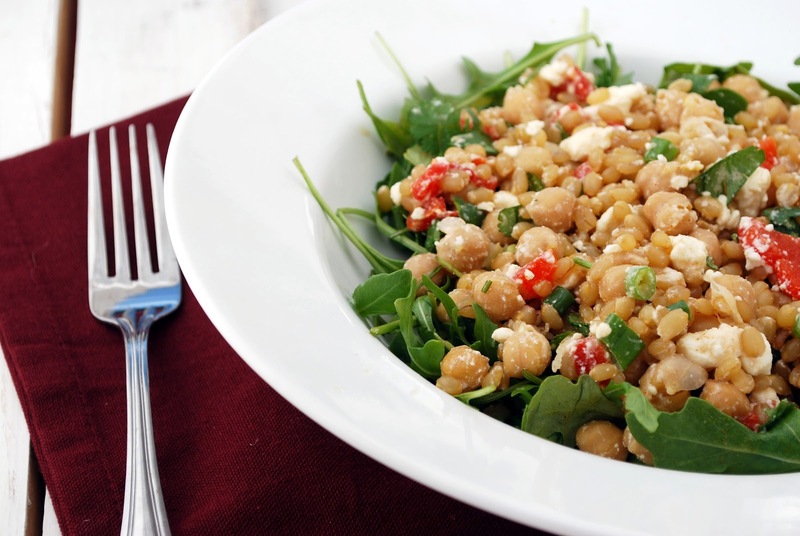 In a separate bowl, toss arugula with remaining dressing. Divide among 4 plates and top each with 1 cup of the wheat berry mixture. If you are making it ahead of time or plan on having leftovers the next day, do not toss the argula with the dressing ahead of time. Simply pour the dressing on top of arugula right before serving.